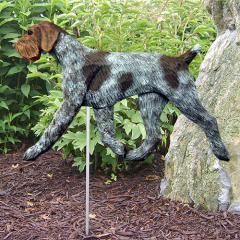 German Wirehaired Pointer Dog Weathervane - this custom wooden hand carved German Wirehaired Pointer weathervane is a superb work of art. It is available in two different sizes: 22" or 32". 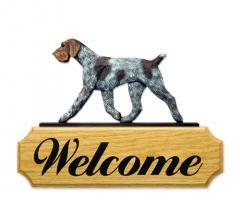 There is a slight variation on the height dimension as it will depend upon the breed. 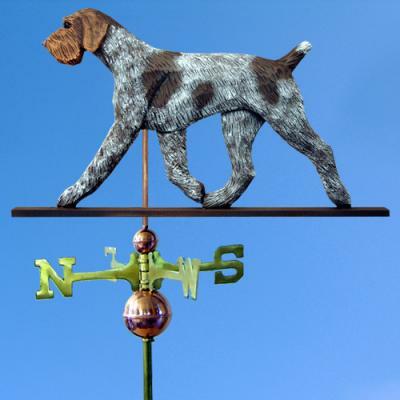 Our German Wirehaired Pointer Dog Weathervane is fully functioning and weather resistant - hand-carved from Basswood, sealed and hand-painted. There is a durable top finish insuring vibrant colors for many years. 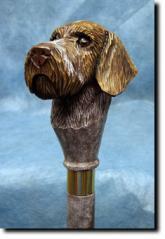 Your German Wirehaired Pointer Dog Weathervane purchase includes the copper spacer balls, a rod, the directionals and ring. Made in the USA. Please allow 4-6 weeks. Delivery Time:Please allow 6 weeks for shipping.